Cost to convert = 8 cents (approx. market value) for a piece of PVC pipe I had in the garage. I also put a FUNN 2.5" riser bar on it and flat pedals. It looks like a Texas longhorn with that wide dirt jumper bar now. Anti-bling... the perfect bike! Way to freakin' GO! I guarantee you'll have more fun on that miserable sled than 99% of us yokels with custom frames. Now those are some wiiiiide bars. Rad ride. What bars are they? I am liking them. Funn bars, but not sure which ones. nice tires.. the one behind the bike. the bike is nice too. Hey! Cool conversion, but let me ask you... the new versions of Aurora are road/touring bikes with 700c wheels. Your bike looks like 26" ATB. I am asking because I am looking at new Auroras and need to know how large a tire I can fit. Thanks. I think it would look perfect with an eccentric hub, but then you'd lose bragging rights for having a sweet and cheap conversion. 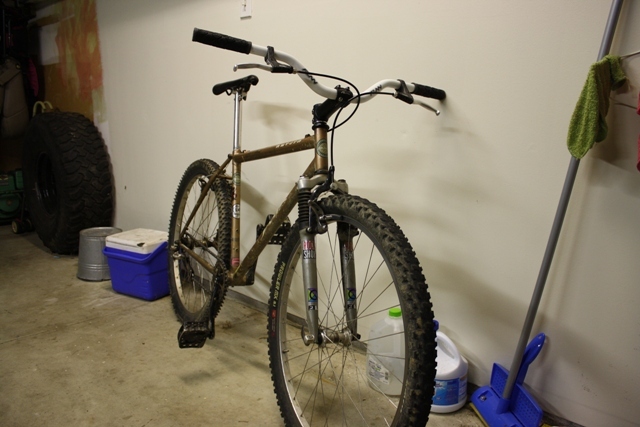 It has always been a 26" mountain bike. I know little to nothing about the bike's geometry, or similarity to Jamis' new Aurora. Sorry. Thanks for the reply. Perhaps I have my circuits crossed, so I'll do more research. shouldnt he get the top pulley to push up onto the cog and the lower pulley to pull down? 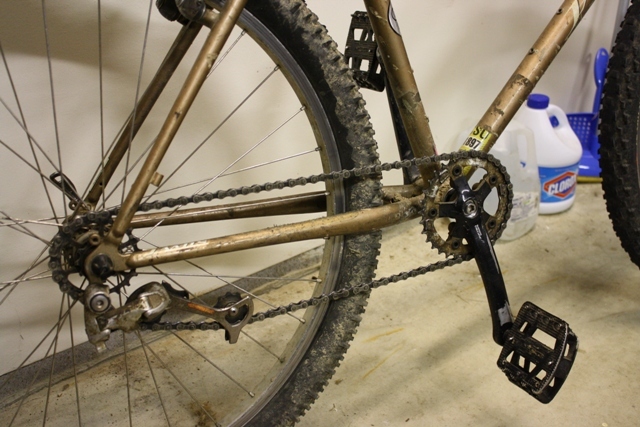 would this give him more chain wrap?